For 1986-2012 FLST - All Except Springer. Heritage / Fatboy For 1986-2013 FLST - All Except Springer. These fenders are thick enough to add rigidity to the front end by acting like a fork brace but can still be cut or shaped enough for an even more Kustom appearance. Each of the seven designs offer a different look and will work with Softail 16"/18" wheel applications. They even offer an Uncut version so you can design your own, but the tabs are already there and predrilled. Cut your own profile, without worrying about it fitting! Fenders are stamped steel, not spun, and E-coated for the ultimate smooth, long lasting fender. All fenders come predrilled. Installation requires use of Klock Werks Tire Hugger Front Fender Mounting Blocks (sold seperately). For 1986-2013 FLST - All Except Springer. Klock Werks design team has taken the guess work out of tire-hugging fender styles. Show off those wheels! Klock Werks Tire Hugger Series Front fenders are thick enough to add rigidity to the front end by acting like a fork brace, but can still be cut or shaped enough for an even more Kustom appearance. Fenders are stamped steel, not spun, and e-coated for the ultimate smooth, long lasting fender. We even offer an Uncut version so you can design your own, but the tabs are already there and predrilled. Cut your own profile, without worrying about it fitting! Installation requires use of Klock Werks Tire Hugger Front Fender Mounting Blocks (sold separately). 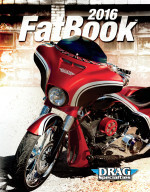 Front Fenders Heritage/Fatboy > Klock Werks > 16"/17"/18"